Are you looking for a ‘locksmith Dalkeith‘ company to sort out your lock problems? perhaps your doors or windows have stopped functioning properly? maybe you need fast emergency access to your accommodation? 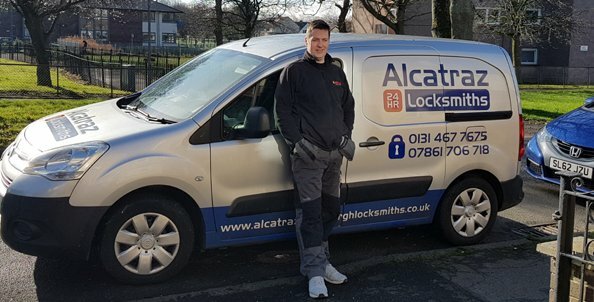 whatever the reason you need a locksmith, Alcatraz – Edinburgh locksmiths is here for you 24 hours a day. We deliver a honest service, at an affordable price. We know what its like to be told a price on the phone, then when the tradesman arrives all of a sudden its a ‘nightmare’ job, and its going to cost such and such extra money, bla bla bla.. Take a look at our many on line reviews on different platforms and you will realise we are a company who delivers on our promise. We can diagnose and give a quote over the phone for anything to do with locks, windows and doors. We can also come to you and provide a free quote, if this would be more convenient. Unfortunately locks have no morals! they do not decide what time of the day is convenient to give up the ghost. That’s why at Alcatraz locksmiths we are ready to deliver a service 24 hours a day. We are based only a few minutes from the city of Edinburgh bypass, so we can get to most parts of EH22 in around 20 minutes of receiving the call. Although there are dozens of reasons why a lock can become faulty, we have a solution for every scenario. We ALWAYS try to open locks in a way that costs the customer the least amount of money. We enjoy seeing a satisfied customer at the end a job – life isn’t all about money to us! The majority of our emergency call outs have to do with nightlatch locks – most people call them a Yale lock. These types of locks can lock them self when door is closed, which can leave the householder locked out if they have left their keys inside the house. A good non – destructive locksmith will open a Yale type locks 99 times out of 100 without destroying the lock. This can be done by many methods, such as inserts tools through the letterbox to open the lock on the other side of the door. If that method doesn’t work, the locksmith can either pick the lock or slide back the locks latch using a special bit of card. Sometimes these locks can literally be opened in a couple of seconds. This is good for the customer as they are back in their property fast, but it can be embarrassing for a locksmith. Charging a customer for a few seconds work can seem cheeky! Although most of the work we do revolves around emergency work, we also provide the more tradition services you would expect from locksmiths in Dalkeith. People could need their locks changed for a whole variety of reasons. Maybe they have moved into a new apartment and don’t want duplicate keys in circulation? maybe they need high security locks to validate an insurance policy? maybe locks need changed after a relationship breakdown? Whatever the reason for your locks needing changed, we will provide a same day service – even if its 3am, we will make it happen for you! We have a variety of locks to choose from so we can meet every customers budget and security needs. From a £10 rim cylinder to a £150 Ingersoll lock, we stock the lot! As well as lock changing we also provide a lock repair service. Sometimes when people think their locks are finished and needing replaced – it’s not always the case. Sometimes locks can become faulty due to a lack of lubrication in the working parts. Many times we go to a job where the key isn’t turning in the lock, or the lock is jammed open or closed. A quick spray of WD-40 in the working parts and ‘hey presto’ the lock is like new again! we know this is not rocket science, but you would be amazed how many times this sorts out a lock problem. Obviously a spray of oil doesn’t sort out every problem – if only! at Alcatraz locksmiths we are very comfortable stripping out locks and diagnosing a locks problem. Not only does this save the customer money on purchasing a new lock, we find this a rewarding side of the job – apart from when you open a lock and everything springs out into a hundred pieces, that can be irritating! For any further enquiries about the services we provide visit our home page or give us a call any time.